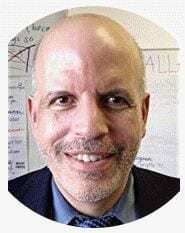 I’ve been writing posts for The New York Times Learning Network for nearly seven years on teaching English Language Learners, and that adds-up to a lot of posts! Many include online student interactives and all include multiple teaching ideas. I thought readers would find it helpful if I put links to them all together, along with short descriptions. Active Listening: Using Times Videos, Podcasts and Articles to Practice a Key Skill is the headline of a post in the New York Times written by Katie Hull-Sypnieski and me. Enriching Academic Vocabulary: Strategies for Teaching Tier Two Words to E.L.L. Students is the headline of this post for The New York Times. It’s a pretty lengthy one – filled with ideas, downloadable hand-outs and links to additional resources. Ideas for E.L.L.s: Finding Reliable Sources in a World of ‘Fake News’ is the headline of a fairly lengthy post at The New York Times Learning Network. Nine Ways to Teach Election 2016 in the E.L.L. Classroom is the headline of this post for The New York Times Learning Network. This interactive for ELLs is about reflecting back on the school year. Student read about the importance of reflecting on their feelings, choose the correct definition of three words, and write about their best moment in class during the year. This interactive is on The Value of Diversity. In addition to reading a passage about the importance of racial diversity, the exercise helps students understand he difference between a summary and a paraphrase. The Art and Science of Happiness is the headline of this interactive. Students learn about a world happiness survey, choose the correct prepositions to complete blanks, and write about moments in their life when they felt happy. Students not having access to the Internet at home to do their homework is the topic of this interactive for English Language Learners. Readers have to put a series of paragraphs into the correct order and choose the most appropriate last passage, in addition to writing their own opinion. The Benefits Of Being Bilingual is the headline of this student interactive for English Language Learners. Students read a passage, have to choose the best summary, study prefixes and respond to a writing prompt. Here’s an interactive on parrots and pets. Students have to choose correct word definitions and a summary, and then write about their favorite pets. This interactive is on the Rio Olympics, and the first American participant who wears a hijab. After reading about her, students identify correct word definitions and write about their favorite sport. Favorite Travel Destinations is the topic of this interactive. Students watch a video, read about two cities, identify correct word definitions, and then write an online “postcard” about visiting a place of their choosing. This interactive is on the Presidential Debates. Students read a passage, identify word definitions, view a “Word Cloud” of common words used in the debates, and respond to a related writing prompt. “Favorite books” is the topic this interactive. Students read a passage, use context clues to identify word meanings, and then write about why reading is important, as well as their favorite books. This interactive uses basketball superstar Stephen Curry to teach about similes. This interactive for English Language Learners is on Daylight Savings Time. Students identify word meanings, explain the context clues they used to determine them, and then respond to an informational writing prompt. This interactive is on citizenship. Students first watch a video of a U.S. Citizenship ceremony, then have to complete a sequencing activity where they put sentences of a speech President Obama made there in the correct order. Next, they explain their reasons and then respond to a writing prompt. The Life of a Refugee is the topic of this interactive for English Language Learners. Students have to put several “scrambled” sentences in the correct order and then determine what sentence would be the most appropriate next one. Changing Your Mind is the title and topic of this student interactive. Students read three short paragraphs and then pick the best summary for each one. They then write about a time they…changed their mind. E.L.L. Practice + Prompt | Chinese New Year is the headline of this student interactive. Students watch a video, read a passage, choose the correct meanings for several words, and then respond to a writing prompt about their own new year traditions. This New York Times interactive is on Looking Forward to Valentine’s Day. It includes a “gap-fill”/”cloze” and a writing prompt. This student interactive is on “Reporting the News With Images.” Students first read a passage about reporting the news online and choose the definitions for several academic vocabulary words. Next, they view a number of interactive news presentations, pick the one they like best, and write about why they like it. This NY Times student interactive for English Language Learners is on Martin Luther King, Jr. Students learn about idioms and respond to a writing prompt. E.L.L. Practice + Prompt | New Year Mission Statements is the title of this interactive for English Language Learners. Students need to identify the definitions of key words (and the clues they use to determine the correct answers) and write about their own one word “mission statements” for the new year. Curing Blindness in 100,000 People, and Counting is the headline of this New York Times Learning Network interactive for English Language Learners. Students choose the correct pronouns that go into the “blanks,” provide evidence for their choices, and respond to a writing prompt. Saving Elephants is the headline of this New York Times interactive for English Language Learners. Students identify the definitions of key words in a text passage, write about the clues they used to determine the correct answers, and then share their opinion about saving endangered animals. This interactive for English Language Learners focuses on the death penalty. Students have to used context clues to determine several word definitions and then write about their position on capital punishment. This student interactive for ELLs is on climate change. It introduces students to the problem, and it also teaches them about the “Five W’s” – who, what, where, when and why. A writing prompt is included. Setting and Reaching Goals, in Soccer and in Life is the title of this interactive for English Language Learners. Students learn about a soccer tournament for the world’s homeless, and apply that to setting their own goals. The Global Refugee Crisis is the topic of this interactive for English Language Learners. Students must choose the correct words that fill-in-the-blanks, as well as share their opinion about if the U.S. should take in more refugees or not. This student interactive for English Language Learners is on “Helping The Homeless.” It includes a sequencing activity that has sentences needing to be put in the correct order, along with a writing prompt. English Language Learner students identify the correct definitions for words and the main idea of a passage in this interactive. It’s titled “The Lessons Football Can Teach,” and students end by writing about one of their past or present coaches/teachers. Extreme Weather Events and Their Aftermath is the topic of this student interactive. After identifying the meanings of several specific words, students are asked to write about a natural disaster or the worst weather they have experienced. Candidates for U.S. President on the Topic of Immigration is the headline of this interactive for English Language Learners at The New York Times Learning Network. Students have to identify word meanings in a passage about the Republicans’ candidates positions on immigration as well as write about it and how the U.S. presidential selection process is different or similar to how leaders are chosen in their home countries. Here’s one on El Chapo’s escape from prison. Students have to determine correct punctuation in a reading passage and then write if they believe he actually used a tunnel to escape. Exploring Pluto and traveling in space is the topic of this student interactive for ELLs at The New York Times. Have your students complete the interactive, which has three questions related to identifying the main ideas in sentences, and then answer the writing prompt. 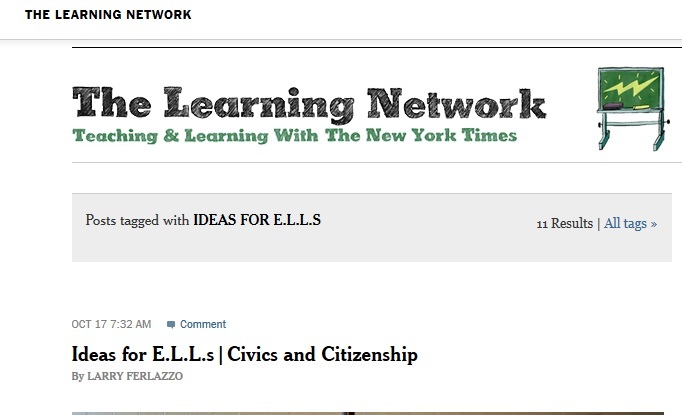 Ideas for E.L.L.s | Immigration is the title of a student interactive at The New York Times. In it, students need to put a series of sentences in the correct order, write about the clues they used to come-up with the correct answers, and share their opinion about President Obama’s efforts to assist immigrants become documented. Wildfires In The West is the first in a new weekly series of ELL student interactives I’m creating for The New York Times. In addition to the interactive content, each one will include writing prompts and sentence frames for students to use. 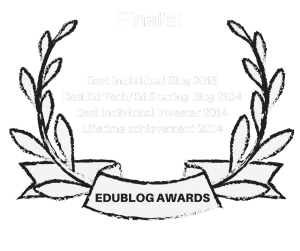 Ideas for E.L.L.s | Celebrating the End of the School Year is the topic of this post. Ideas for E.L.L.s | Teaching and Learning About Work and Careers is, I think, a particularly useful and expansive one. In fact, my original version of the post was so long that a piece had to be deleted and I published supplemental materials here. Ideas for E.L.L.s | Teaching and Learning About Animals is filled with ideas and multimedia resources for teachers of English Language Learners. Teaching About Weather and Seasons is the topic of this lesson. It discusses using jazz chants, photos and more! Students put “scrambled” sentences in order to correctly re-create a paragraph from a story about schools, and are encouraged to create their own sequencing activities. Another teaching activity is having students identify their visions for their own school and write an argumentative essay about it, as well as meeting with their principal. Students complete a cloze (fill-in-the-gap) activity in an article about the World Cup, and use the same passage and other teaching ideas to learn about synonyms. Learn about “articles” in the English language through a cloze activity about Mexico City and additional exercises. In addition, a teaching idea provides suggestions on how to have students create their own itineraries for trips around the world. This Mother’s Day interactive and supplemental activities focus on conjunctions and having students do writing about their mothers or other key family members. Students separate run-on sentences in this interactive about International Dance Day, and use it as a model for creating their own. In addition, they can view a variety of dance videos and write a compare/contrast essay. Learn about punctuation in this interactive on body language and supplemental exercises, and then have students do some fun listening activities with different videos to see if people are being truthful or not. Have students learn about nouns in this interactive on the popularity of soccer in China. Then, have students complete (and then create their own) “scrambled” exercise where they have to place answers with the correct questions in re-creating interviews. Students learn to categorize words in this interactive on eating insects, and then broaden their categories further. In addition, they can watch engaging insect videos and describe — verbally and in writing — what they see. Fill-in-the-blanks in this story about “chewing gum art” and have students create their own artwork online, which they then describe both verbally and in writing. Complete a cloze about how animals can impact children’s heath, and then students can draw, write or even create a video about pets that are or have been in their lives. Use a passage about fossils and dinosaurs to learn new vocabulary, practice pronunciation with tongue twisters, and practice a simple paragraph-writing framework. Learn about comparatives and superlatives while learning about skyscrapers, as well as having students building their own as part of the Language Experience Approach. In addition, students can use “close reading” techniques as they watch a documentary about the history of tall buildings. Practice prediction with students as they reading about Valentine’s Day and learn about idioms at the same time. Plus, have students create Valentine’s cards and share about romantic traditions in their home countries. Fill-in-the-blanks in this passage about preparation for the Sochi Olympic Games, and use the event as an opportunity to practice writing and listening with a Picture Dictation activity. Students learn about the progressive tense in this passage about the changing nature of families, and use the article as a stepping-stone to a lesson of creating family trees — with a twist! Use this fun activity to learn about prepositions through reading incorrectly translated passages and street signs. Learn about holiday food traditions from different cultures though a fill-in-the-blank passage and different lesson ideas. Have students watch videos about current events and craft higher-order thinking questions about them. Students practice the reading strategy of summarization while, at the same time, practice using humor as a language-development activity. Students watch a short video and have to list the scenes in the correct sequence. They can then create their own similar “quiz” for classmates and even create their own videos. Choose the most accurate description of a picture taken at a United Farmworkers Union demonstration and have students reflect on protest movements in their home countries and in the United States. Use the lesson to expand to other historical photos and use them for language-development activities. Teach and learn the past tense through a passage about John F. Kennedy, and use a text data set for an inductive lesson about his life. Watch a video about the Mexican wrestling style called “lucha libre” and use it in a sequencing lesson. Then have students create their own wrestling personas. Watch a clip from West Side Story and use it for a musical sequencing activity. Then, have students research and write about gangs today. Learn about The Day of The Dead and Halloween, and use it as a lesson in developing literal and interpretative questions. Learn pronouns and the importance of learning from failures and mistakes through this interactive on J.K. Rowling, the author of the Harry Potter series. Watch a video and read a passage about a girls soccer team in Mexico to learn about punctuation, and have students create punctuation games and practice reading strategies, too. Teach the vocabulary of colors by a fill-in-the-blank passage, a discussion of their cultural significance, and the use of a Times’ “grid” of different photos that students have to describe in a game-like activity. Learn about magic in a sequencing activity and develop academic vocabulary while exploring different illusions. Study the use of “articles” and learn about the concept of “grit” (perseverance) through online interactive exercises. Study the 9/11 terrorist attacks through a K-W-L chart and Venn Diagrams that lead to writing a compare and contrast essay. Learn about mariachis and use them to kick-off an exploration of the different aspects of students’ home cultures. Use a passage about soccer star Lionel Messi to encourage students to create their own fill-in-the-blank exercises for classmates to complete. Encourage students to reflect back on their class year, and provide them with suggestions on how to continue their study during the coming months. Teaching and learning strategies about the environment and Earth Day. Using videos, photographs and music for language-development activities, including ones to practice descriptive language and make a connection between art and activism. Learn about the Picture Word Inductive Model as a teaching/learning strategy, as well as sequencing activities with videos and a fun language-learning game. Multiple lessons focused on different holidays and holiday traditions. Using video clips for language-development, learning about Malala Yousafsai, discussing the length of the school year and more! Many lesson ideas about politics and elections. A mixture of activities, including ones on idioms, recipes, developing neighborhood tours and writing a compare/contrast essay. Ideas on using students’ personal stories to maximize the effectiveness English-language development lessons.